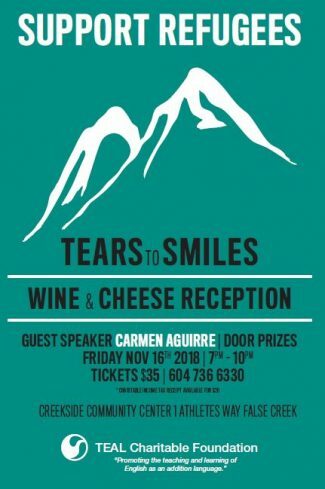 The TEAL Charitable Foundation’s fourth annual fundraiser for refugees, ‘Tears to Smiles’ – Wine & Cheese Reception is coming up soon and we hope you’ll join us. The event will be held at the Creekside Community Centre in Olympic Village on Friday, November 16th from 7:00 pm to 10:00 pm. Tickets are $35 and include wine, cheese and door prizes. All funds raised will go towards supporting refugee education. This year we are very fortunate to have guest speaker Carmen Aguirre at our event. To purchase tickets or for more information, please contact the BC TEAL office at admin@bcteal.org or phone (604) 736-6330. Tickets will also be available for purchase at the door. Thank you to our sponsors, VGC International College (silver), Kaplan Internation (bronze) and Educations and Training Employees Association (bronze). We look forward to seeing you there!